I tried to make the Cloudflare patch compatible with Openssl-1.1.1-pre9 by myself, by adding the CHACHA-Draft back to it, but I met a lot of difficulties and caused many errors. I think it's useful, but the draft version is obsolete. As of 1.1.0, chacha20 supports the rfc version, not the draft version. 1.0.2 and 1.1.1 have a lot of differences, which makes it difficult to patch. I will try, but I do not know if it is possible. P.S. Google(google.com, etc.) has already removed OLD CHACHA from SSL Cipher. Though draft version ciphers are obsolete, they are still secure. 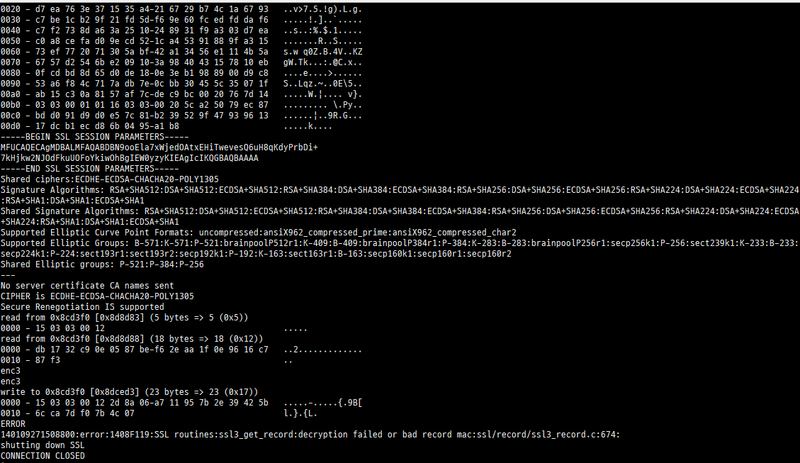 As far as I know, Cloudflare is still using Draft version ciphers to perform handshake with Android 6 devices. No matter is it possible or not, thank you very much. And I've learnt a lot from your patches. I tried to support the CHACHA draft and the CHACHA draft handshake succeeded, but subsequent encryption and decryption failed. I have searched for related materials, but for me, assembly is too difficult. I am currently consulting documentation on encryption and decryption after handshaking. Encryption and decryption after handshaking is more difficult than handshake... You can read the code in BoringSSL branch 2987, it's a good example that it has both RFC version and Draft version. I tried to rewrite the code with these documentations, but I can't even compile it successfully! maybe chrome or firefox on android 6 could use rfc chacha20 , and chrome support tls 1.3 draft28 now. @hakasenyang is that mean we dont need draft 23 anymore? I tried to try it all the time, but it is very difficult. I'm sorry. I think it is probably hard to solve. That's all right...you needn't say sorry at all. It is really a difficult thing. I'm sorry that this issue maybe cost you a lot of time :( . Thank you anyway! @ymshenyu Yes. I already responded to the patch. I upgraded my openssl and used your patch again, however this time my server cannot even establish tls1.3 handshake? I have no idea that can original nginx and original openssl support tls1.3 if I don't use any patch? Your server has not been enabled for TLS 1.3. Please check your nginx settings and the openssl version again. BoringSSL with Nginx trunk can use 0-rtt now . but i dont like BoringSSL because it didnt support ocsp stapling by default . and i dont want to use it patch to turn it on . @JemmyLoveJenny well , reconfigure openssl without patch ? @JemmyLoveJenny Could you test the openssl build with this version? @hakasenyang I am concerned about the efficiency of the code. I don't know whether "if" judgement execution(your e_chacha20_poly1305.c) or multiple sequential execution(mine) is the quicker one. I'm sure that mine uses more memory than yours, but how about the speed? One indirect function call is more expensive than one if condition. Several if conditions are more expensive than an indirect function call. You are waiting on the latency of the user, and you are handling stuff he can look at (i. e. there won't be huge amounts of checkboxes). Optimizing code that is executed less than a million times per second on a detailed level like this is absolutely pointless. @hakasenyang openssl-1.1.1-chacha_draft.patch , test pass! And what is this tool? You can download this site. It is a tool called testssl.sh. I used the -E argument. @hakasenyang Do you have any idea about how to make this patch compatiable with newer versions of OpenSSL? You can find the number 1195 in the patch. If the patch fails, a .rej file is generated. You should refer to the .rej file and modify it again.